Do you love a good adventure with fun and unique angles? "Bound and Determined" checks all the right boxes, and was a pure delight with its originality and wit. Private Bradley Willis will be familiar to readers of Jennings' Fort Reno series. As someone not always in good graces with his superior officers, Bradley often finds himself needing to prove his merit and worth to the cavalry. After another questionable incident, Bradley is given the task of escorting a retired captain across Indian territory. How hard could that be? It turns out Major Adams left out a few details about his assignment. The captain has acquired a train of camels and is seeking to travel overland with them to his Texas home. The assignment also didn't mention Captain Herald's daughter Ambrosia, who is along for the journey and is sweetly but stubbornly on the lookout for ways to convince her father to abandon the camels. Ambrosia is worried about her father's health and she doesn't want to give up their garden to house a bunch of smelly camels. She thought if she couldn't convince her father to change his mind that she'd at least be able to find ways to dissuade anyone who was sent to help them. It turns out she's met her match in Private Willis. As determined as she is to find ways to abort this mission, he's equally as determined to see it through. The camels add a wonderful amount of personality to this novella. I learned a lot of things about these wonderful animals that I never knew before! I laughed out loud at Bradley and Ambrosia's antics, and there's enough action and danger to keep you glued to the pages. 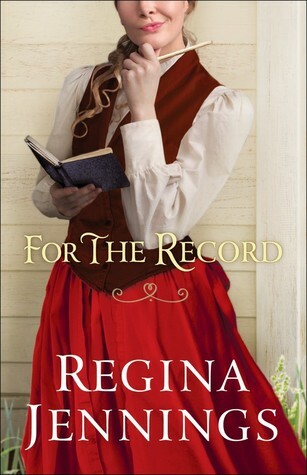 A highly recommended story from Regina Jennings! Katie Ellen likes to keep things orderly and within her control. One thing she can't control - Josiah Huckabee and his strange behavior towards her. Once she thought he must have been sweet on her, but ever since their kiss at the church picnic two years ago he's seemed distant and skittish. A series of Ozark mountain gully washers leaves Katie Ellen stranded while her parents are out of town, but she's not alone. Josiah managed to be on her side of the creek before the bridge washed out, as well as a stranger whose intentions are quite questionable. Determined that no one is going to hurt Katie Ellen, Josiah tells the stranger that she's his wife. He wants to make her his wife pretty soon anyway, even if she is contrary and stubborn as all get out. Can they manage to keep up the charade of being married long enough for the stranger to be on his way? This novella is short and amusing, though I wouldn't say it's the author's best work. It's a fun premise, and it's nice to read Josiah's story after having gotten to know him in the Ozark Mountain Romance series. Those are novels I'd recommend for fans of funny historical fiction. 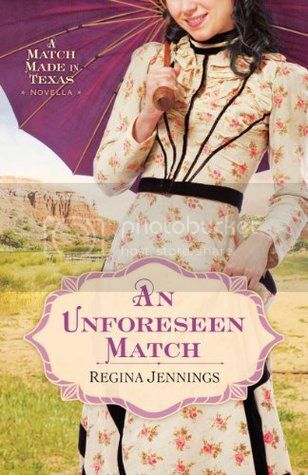 I was a little hesitant to read this final book in Regina Jennings' debut series, only because I had two very different feelings about the previous books. I'd loved the first one but felt the second one wasn't for me, and I also wasn't sure how Anne Tillerton would be as a main character. 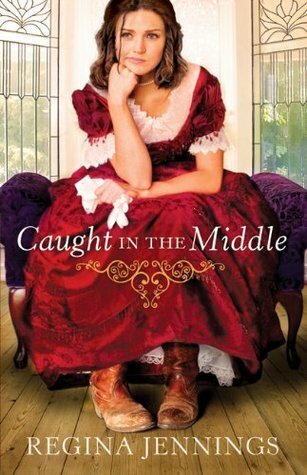 However, I'm pleased to report that "Caught in the Middle" captured my heart and it's one I would recommend to all fans of the historical or western genres. Anne was a secondary character in the first two novels in this series, and her background is full of neglect, abuse, and sorrow. To escape from the public spectacle she had become in Texas and protect herself men who might try to repeat the crimes against her, Anne has left off anything womanly and is surviving as a buffalo hunter in Indian Territory. Thinking she's found freedom and peace at last, her world is turned upside down when an infant is left in her care. 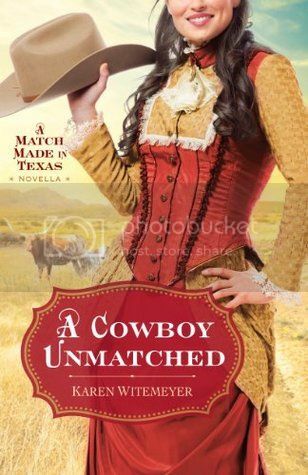 At first Anne wants nothing more than to find the boy's father and get back to the open range, but then her heart begins to hope that Sammy might be her chance to have a family of her own after all. As a social-climbing, appearance-conscious entrepreneur, Nick Lovelace is intrigued when he recognizes Anne, who was friends with his sister back in Texas, while sharing a train ride with her. He's sheepish when Anne ends up saving his life when the train is held up, and offers to help her in any way possible in the future. When Anne shows up at his office in need of a job in town so she can take care of Sammy while searching for his father, Nick's social reputation is put on the line. While he enjoys Anne's unique perspective and keen mind, not everyone is thrilled that this businessman and aspiring politician employs a woman who dresses like a man and has a shady background. As the story progresses, Nick and Anne must make sacrifices for each other and for Sammy as they work their way through issues that come up. When Nick's business is threatened and he discovers political corruption, there's no one he wants on his side more than Anne. 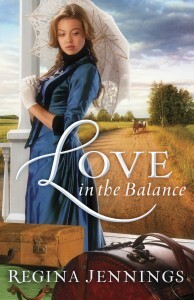 Anne must decide how much she can trust Nick and trust the Lord on this new path she's on. When Sammy's family is finally found, she faces a crisis of will and emotion. Her heart caught in two places, the biggest challenge of her life is set before her. I'm so glad I decided to give this book a shot. Once I started reading I couldn't put it down. I enjoyed seeing the names of different places in Indian Territory, as I grew up in Oklahoma and was familiar with the towns described. On a spiritual level, my heart beat strong with the theme that God may ask us to give up the things we think we want, but in the end His plans are above and beyond what we can imagine. Anne finds that He is trustworthy, and this is what I have found in my own life as well. Current Mood: hungry - time for lunch! 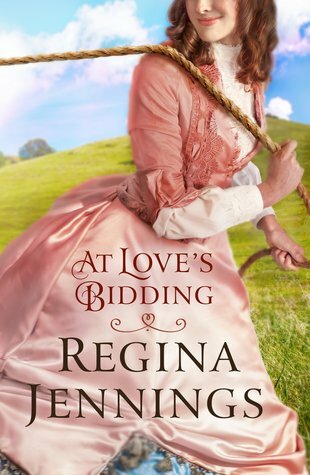 Last year I highly praised Regina Jennings' debut novel "Sixty Acres and a Bride." I love it when authors take a twist on a Bible story and breathe fresh life into it. Jennings took the account of Ruth and set it in Texas in the 1870's. If that's not innovative, I'm not sure what is! I'd love to see her do more stories like that in the future. Her second release, "Love in the Balance," is about Molly, the headstrong flirt who tried to steal the hero's attention in the first novel. Molly knows what she wants and is not afraid to go after it. I didn't really like Molly as a secondary character, so I knew going into this story that I was going to need to extend some grace to this woman who probably could not be more unlike me if she tried. Molly was raised to marry a wealthy man, and her parents will not be happy with anything less. 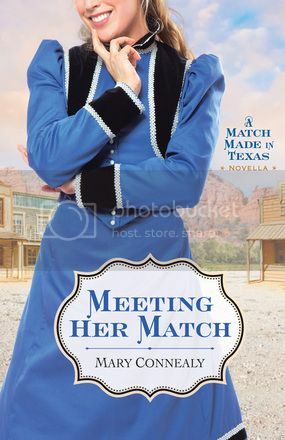 But she's fallen for Bailey, a poor cowhand just trying to get his start in life. Bailey escorts her every week to and from a larger nearby city, where Molly boards on weekdays so she can work at the courthouse. Their intentions are to marry one day. At least it is until the Sunday Bailey stands up in church and confesses that he is being distracted from following the Lord's will by a temptation. Everyone knows he is speaking of Molly. Suffering such public humiliation, Molly decides it is time to seek a new man to sweep her off her feet, or at least make Bailey jealous when he sees how quickly she moves on. In her effort to find a rich and suitable suitor, Molly gains few friends. Her ambition is too clear. When the wealthy Edward Pierrepont shows up, passing through on his western tour, Molly sees him as a means to an end. He has the family connections her mother desires, the money which could help her father save his business, and he is definitely a way to show Bailey that she won't wait for him. She'd take Bailey back in a heartbeat, but a man who speaks mysteriously and showers her with gifts is just what she thinks she needs to pass the time. Meanwhile Bailey struggles to find employment and balance his need to provide for a future family with the calling he feels on his heart to minister to those around him. His every heartbeat is torn between desiring Molly and desiring God's will. Is there no way for the two to meet? When sudden hardship befalls Molly's family and she must make a decision, boundaries are tested as to how far Molly and Bailey will go to stay together, as well as how far blind duty might take one. There's no way I can tell you what happens without giving away too much of the story. It's a tale where things get much worse before they get better. Consequences are faced on both sides, heavy guilt is borne, determination is questioned, and each have chances to grow. This story shows how God can be glorified even in our worst mistakes, and what looks like horrible circumstances can in time bring out His best in us. I wish no one would have to face hardships like those faced here, but I count people my friends who have found themselves in similar circumstances. We make mistakes. People take advantage. Our temptations seem more than we can bear. But when we are truly broken before God, that is when His strength is made perfect. Due to subject matter, I would caution younger readers from this story. I received my copy from LitFuse in exchange for this honest review. All opinions are my own. Click on the link below for information about an author party and giveaway on April 4th. Rosa Garner is a young widow of Mexican descent who is finding her way among a new land and people. Her mother-in-law, also a widow, is returning to Texas in 1878 after ten years away in Mexico. Rosa has embraced the faith of the Garner family and is determined to help Louise reestablish herself. But she hears the whispers. She sees the stares. She's an outsider who is distrusted by the community because of her differences. She must work hard to earn a place among them. Louise's nephew, Weston, has built a successful ranch for himself. He's still hurting from the loss of his wife five years earlier but he's beginning to feel ready to give society another try. Noticing Rosa's vulnerability due to how unfamiliar she is with traditional propriety, he requests that she find work only on the homesteads of family members. This new cousin is another to seek to protect and provide for. As summer progresses, Rosa works harder than she ever has before. Louise will lose her home if they do not come up with a way to pay all the back taxes. As the deadline draws near, Rosa is determined not be beholden to anyone... even if it might come down to asking Weston to become involved. This retelling of the Biblical Ruth account was extremely well done. 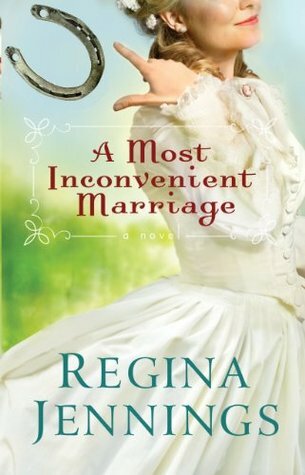 Regina Jennings has hit a home run with her debut novel and I look forward to seeing more releases from her in the future. The only two complaints I had was that I thought the last third of the book could have used some tightening up in the editing process. The passionate feelings our main characters experienced were also expressed, if I may, rather honestly. It wasn't overly edgy but it was a little more intense than I usually read. This page-turner is sure to bring in lots of praise. Thank you to Bethany House, who provided me with a copy in exchange for this honest review. All opinions are my own.